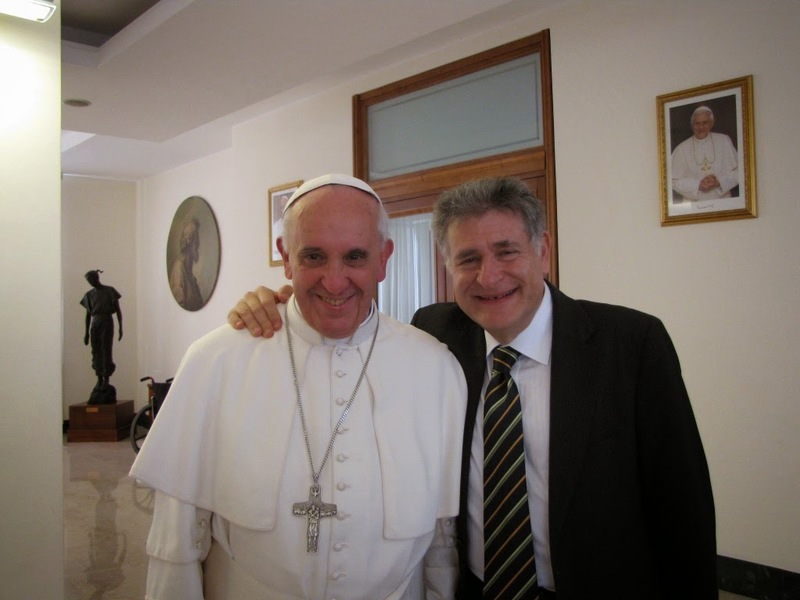 Two peas in a pod, Jorge Bergoglio & Abraham Skorka. On a recent visit to Los Angeles, Rabbi Abraham Skorka, an Argentine rabbi, chemist and writer, met with the staff of the Jewish Journal. Skorka’s trip was sponsored by Masorti Olami, the worldwide organization of the Conservative movement, and his prominence is due in part to his position as rector of the Conservative rabbinical seminary in Buenos Aires, where he is also a rabbi at Benei Tikva congregation. But it is Skorka’s longstanding, deep friendship with then Argentine Cardinal Jorge Bergoglio, now Pope Francis, that has given Skorka an international platform. The two friends co-authored a book on interfaith dialogue titled “On Heaven and Earth,” based on more than 30 television shows they co-hosted in Argentina, and the pontiff chose Skorka to write the introduction to his official biography. In May 2014, Skorka accompanied the pope, as part of the papal entourage, to the Middle East. At the Journal’s offices, Skorka, 64, ate pizza and salad — famished after a day of nonstop meetings. He is of medium height, with a shock of salt-and-pepper hair and an academic’s well-worn suit and tie. He switched easily among English, Spanish, Hebrew and Yiddish — all languages in which he is fluent. The focus of his visit was to promote the Masorti/Conservative worldwide movement, but the conversation began with the week’s shocking news out of Argentina, the alleged murder of Alberto Nisman, the special prosecutor charged with the investigation of the 1994 bombing of the Asociacion Mutual Israelita Argentina (AMIA) Jewish center in Buenos Aires. Just before Nisman was discovered dead in his apartment, he had pointed to a cover-up in the case involving both Iranians and Argentinians at the highest levels of government. Jewish Journal: What is your reaction to the news of Alberto Nisman’s death? Abraham Skorka: There are many, many questions to ask, and we don’t know exactly if we will receive answers within a short time or in a long time. This I say taking into account our waiting of 20 years since the bombing of the AMIA, 22 years since the bombing of the Israeli embassy. We, as Jews, are suffering, especially because all of the story is related to the drama of the bombing of the AMIA. But this is not a specific Jewish drama attached to the Jewish community; this is an Argentinean drama. JJ: Do you trust that the authorities will pursue this with rigor? AS: I don’t know. This is not a matter of faith, of trusting. This is a matter of evidence. Look what occurred in Paris. The same day, or the day after the attacks [on the Charlie Hebdo magazine and the kosher market], they knew exactly at whom to look. JJ: In the book you wrote with Pope Francis, “On Heaven and Earth,” you wrote about how the AMIA bombing created a separation between the Jewish community and the government. AS: Look, in the history of what occurred after the bombing, yes, it was a separation. Why? Because there are black holes in this history where [evidence] disappeared. Because we know from the security agencies exactly the people who prepared the attack, but who were the local connections? This is a mystery nowadays. And this provoked some gap between the government and the Jewish community. But the first steps that [former Argentine President] Néstor Kirchner and [Néstor’s widow and current President] Cristina Kirchner took were very important steps in order to decipher exactly what happened. With time, the story, in accordance with Nisman’s words and concepts, [changed]. JJ: What do you feel is the benefit or the impact of creating interfaith relations at a time when the more extremist sects of religion seem to be creating more divisions than ever? AS: They are very, very closely related. Why? Because all fanaticism is based on the idea that the truth is in their hands. Interfaith dialogue shows that we, as religious people — Muslims and Jews and all the Christian denominations — know that we share a truth. Empathy means that you have the capability to put yourself in the place of the other, to understand the other. It’s when you embrace this attitude, this is the best answer to those fanatics, to say, “I am very religious, as religious as you, but I understand that what God is asking from us, first and foremost, is to respect the other.” Why? Because in the other is the image of God. JJ: But how does that affect the fanatics within that religion? They’re not going to sit with you. AS: Look, what the interfaith dialogue can do — or must do — is it must give answers to violence. I’ll give you a very simple example regarding this point. Some people in Argentina prepared a declaration against what occurred in Paris, quoting the words of the pope, and they asked all kinds of very important Argentinians to sign this document. The first three signatures were from the archbishop of Buenos Aires — the new archbishop of Buenos Aires — my signature and the third was of the Islamic teacher — Omar Abboud. So this is a symbol, a very, very important symbol, that can make a very strong impact. A Muslim, a Jew and the archbishop of Buenos Aires, the three of us with a special history in dialogue are the first signatures condemning in the harshest terms what occurred in Paris. JJ: Did you agree with the pope’s comments against cartoons mocking religion? AS: I do. Look, don’t forget that he blamed in the harshest terms the murder of the people. Regarding the cartoons, I agree with him. Why? Look, this cannot be in any way an excuse to kill the other, but remember the role played by caricatures of Jews in the Nazi era? JJ: What drew you to interfaith work? AS: The theme of the Shoah was a central theme in my life for several reasons. All my family, from my father’s side and my mother’s side, perished. So this was a trauma in my father’s life, and he transmitted this anguish to me. This is point one. So I arrived at the conclusion that I would work on this theme. A similar sentiment happened with the archbishop of Buenos Aires [now the current pope], and he opened the doors of his heart, and we began working together. JJ: Why do you think he chose you? AS: I asked him this question. It was a very special moment. I went to be with him when his brother died, and there are special places where the corpses rest — in Spanish, they call it “velatorio” [funeral parlor]. So we spoke about life, and suddenly I asked him, “Let me ask you a question.” “Yeah, ask.” “Why did you choose me?” And he said, without hesitation, “It came out from my heart.” And he revealed to me at so many opportunities a deep sentiment of love, of real love. This is the highest stage of dialogue, the highest stage. There is a very important Catholic university in Buenos Aires that is related to the Vatican, Pontificia Universidad Catolica de Argentina. 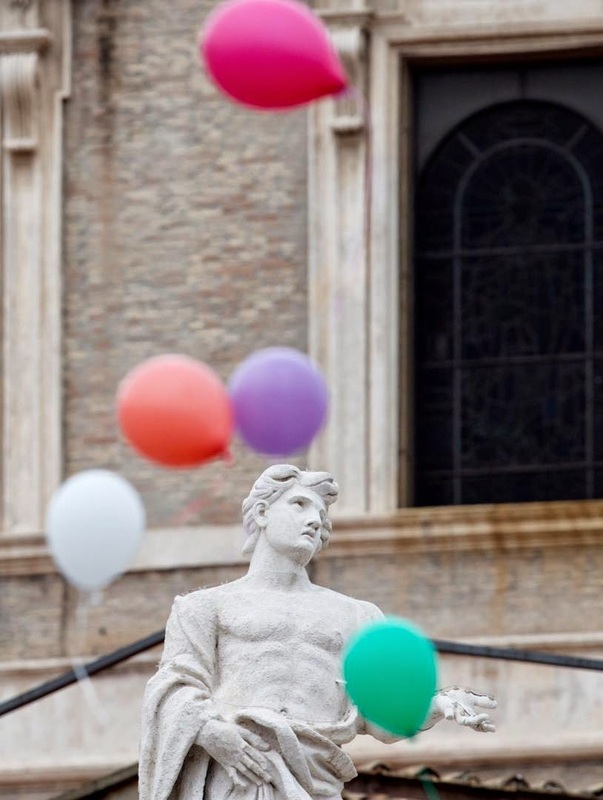 In recognition of 50 years since the beginning of the sessions of the second Vatican Council, they prepared a special celebration. And what was the center of the celebration? To bestow upon me a Ph.D. degree, an honorary doctorate. The symbolism of this moment was tremendous. Why? Because [Pope Francis] tried to emphasize very clearly: A rabbi can also be a teacher for us Christians and Catholics. At a certain moment in this ceremony, he stood before me. He told me, “You cannot imagine how long I have dreamt of this moment.” He has a very deep feeling regarding a Jew with whom he bound himself to Judaism. JJ: Why do you think that was important to him? AS: Because he very much relates to the image of Jesus. And he knew that Jesus was a Jew, and that Christianity and the rabbinic Judaism developed in the same way. JJ: Have you studied Torah with the pope? AS: Yes, at several opportunities, yes. JJ: Do you know if there’s part of Hebrew Scripture that the pope has mentioned as having an impact on his thinking? AS: Oh, his favorite Torah. The figure of Abraham is very important to him. The attitude of Abraham. JJ: In terms of questioning God or challenging God? That part of Abraham? AS: Yes. He very often quotes verses from the Tanakh. JJ: So do you consider him your friend? JJ: What’s his email address? AS: That’s a good question! JJ: Why do you think that there continues to be such reverence toward the pope, even as the world becomes more secular? AS: First of all, you must separate two concepts: religion and religiosity. Religion means the church, the synagogues and institutions. Religiosity is the fire. Maybe that the world is, from an institutional point of view, more secularized, but the fire still exists. Without this fire, you cannot continue living because life loses its meaning. To live, you need some hope. The second point is that when you study the prophets, [they] emphasized that to worship God means, first of all, to honor the human being. And this is the message that [the pope] is spreading throughout the world, because he revealed himself not only as a leader for the church, but for the world. First it was showers in St. Peter's Colonnade, now it is free haircuts! Another one from the you can't make this up file. Feeding, clothing, providing shelter, and taking care of the needs of the homeless are Corporal Works of Mercy. 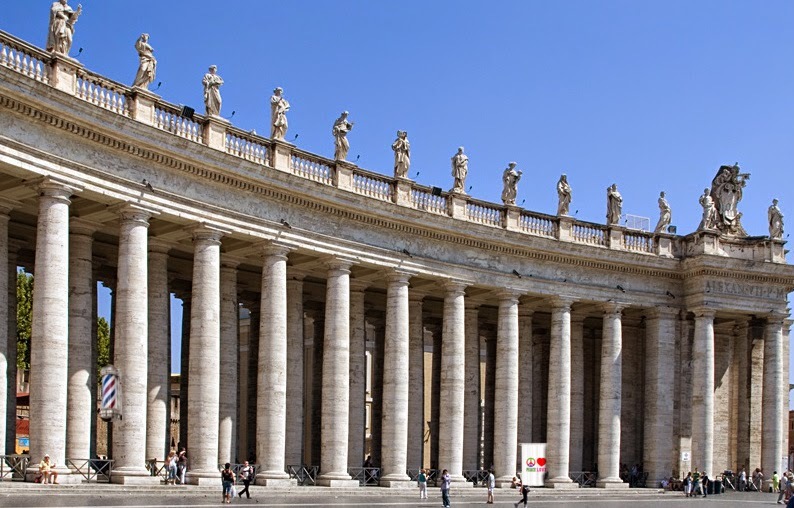 The Vatican owns plenty of buildings in Rome which they could turn into an alms house and provide for the care of the homeless. Charity has traditionally been done quietly and often anonymously by Catholics. Instead, they take part of the jewel of Catholicism and turn into a center concerned about the body. What about saving souls? All this is to draw attention to you know who, his most humbleness himself, Francis. The homeless will soon be able to use not only shower and toilet facilities but also a barber service in the Vatican, ANSA learned Thursday. 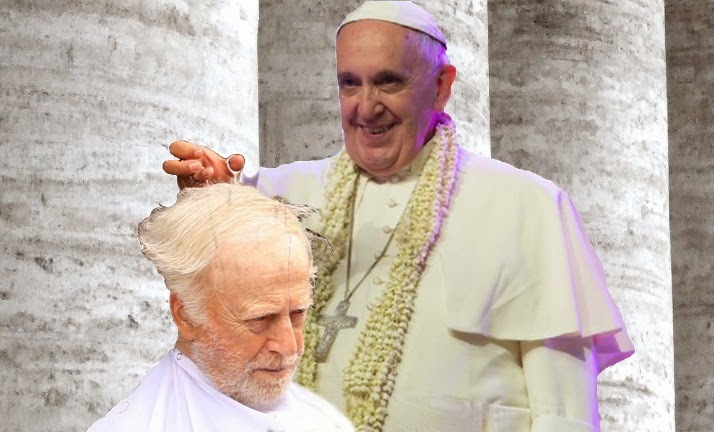 Haircuts and shaves will be available to the down-and-out free of charge on Mondays - the day on which barber shops and hairdressers in Italy are traditionally closed - starting February 16 under the auspices of the Office of papal charities. The service will be provided by volunteer barbers who have already donated razors, brushes, scissors, a mirror and a barber's chair towards the effort. The showers and toilets should also come into operation on February 16. All services will be located in newly renovated premises under St Peter's colonnade. What's next a laundry? How about a Goodwill store? Why not sleep all of Rome's homeless under the colonnade? We wonder, will the Swiss 'gossip police' Guard patrol the hair cutting area of the colonnade? After all, Francis told us gossip is murder. 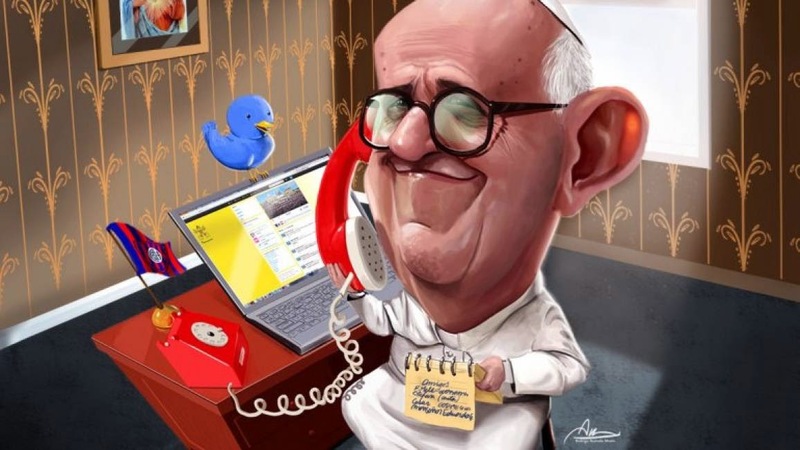 Francis loves to rant on and on about NGO's while he goes about his wreckovation of the Vatican which with every blow resembles more and more an NGO. Is it possible Francis could show up on 16 February 2015? We at Call Me Jorge... thought this a very interesting article. On the night of December 13, almost exactly 50 years ago to the day, a student named Franz wandered through the streets of Münster. He could not sleep. He was too upset by the homily he had heard in the cathedral earlier that evening, delivered by a young priest and professor only a few years older than himself, which interpreted Advent and Christmas in an entirely different, even revolutionary way: the old doctrine, according to which human history falls into a time of darkness and a time of salvation - namely, into the time before and the time after the birth of Christ - is one which no one today can take seriously, said the young theologian. Who, after the World Wars, after Auschwitz and Hiroshima, could still speak of the 'Time of Grace' which began 2000 years ago in Bethlehem? No, the dividing line between the darkness and the light, between captivity and salvation, does not divide history, but rather our own soul. Advent is not an event which takes place in the calendar, but rather in our hearts - or it founders there fruitlessly. That's strong stuff, and one can easily understand why the young student had trouble finding sleep after this homily, and instead wanted to be alone to think it all through. Today, both the student and the priest of this memorable evening in Münster are old men: Franz Kamphaus, who suffered that sleepless night, and Joseph Ratzinger, the 37-year-old academic rising star who was shaking up students of theology. It is remarkable how the lives of these two men crossed paths for the first time. In retrospect, these two names - Ratzinger and Kamphaus - stand for two paths in Germany which, though they need not be labelled as 'right' and 'left,' were nonetheless quite divergent. Both attempted to preach Christianity under a different set of circumstances and to somehow translate it safely into the modern world - and they fought bitterly over the true and false compromises being made in the relationship between Christ and the World. And now, at the end of life and despite the distances separating them, the two men remain connected through a shared result of failure: Christianity in Germany is ideologically bankrupt. Neither the humble, charming manner of Kamphaus nor the clever theology of Ratzinger, who helped to govern Germany from Rome, could change that fact. Not even a German Pope - who then, less than 20 years after the war, would have even considered such a thing possible? - could reanimate Christendom in Germany. Other than a bit of national pride and a few pleasant snapshots, nothing remains of the German pontificate. Kamphaus and Ratzinger, Modernists and Traditionalists, eager reformers and stolid conservatives: all stand before a common shambles in Germany. Of course, one could deny it all. One could say that Germany is still a Christian country, because nearly two thirds of all Germans belong to one of the two major churches; because German children, even those on public schools, are instructed in religion; because there are crosses hanging in our courts and classrooms; because the Church does valuable work in kindergartens and hospitals. Even in the Preamble of the Constitution, there is still a reference to God, and the Chancellor called upon the aid of God while she swore her oath. And Germany is not a Christian country? Yes, the historic backdrop is still there, and it is surprisingly well conserved. In many respects, however, the Church in Germany today is comparable to the German Democratic Republic [GDR; Communist East Germany (1949-1990)] in its later days: it looks stable, but it stands on the verge of collapse. And, like in the last days of the GDR, many officials are fooling themselves. Pastors and bishops, as well as many active parishioners, see blooming landscapes where there is nothing but desert. Love, as they say, is blind. And where existential threats are concerned, a calculated optimism often clouds a sober view of reality. Shiny new facades and robust structures assist the work of self-deception: there are ca. 45,000 churches in the country and most of them - structurally speaking - are sound. This year, the Catholic Church and the Evangelical church in Germany has taken in more money than ever before. German church music is the best in the world. There are still 44,000 Catholic weddings and 225,000 Evangelical confirmations every year. What crisis? All that's missing is the argument that the churches are the second largest employer in Germany, offering more than a million people secure jobs - and the Church has finally arrived at a level of legitimization equaled only by the local garbage dump. Only a Church which is a community of faith, and not merely an employer or a pillar of the social system, can be taken seriously. And precisely that - the common faith - has largely vanished into thin air. That only a third of all German believe in the Resurrection of Christ should be a cause for concern in the Church, especially given that, according to the files, two thirds are Christian. But it's much worse: even among the faithful, core elements of the Christian message are widely rejected. 60 percent do not believe in a life after death. At the same time, one in four Germans believes that black cats bring bad luck. More people between Flensburg [in the extreme north] and Oberammergau [in the extreme south] believe in UFO's than in the Last Judgement. Welcome to Diaspora Germany. Just how little confessional affiliation still has to do with faith was revealed by a survey conducted by the Allensbach Institute for the Catholic Church. The results were so devastating, however, that they were never published. To the question, 'Why are you Catholic?' 68 percent gave the answer: "Because it allows one to celebrate the important events of life in the church, such as weddings and baptisms." The refreshing honesty of the second most common answer is no less admirable: "It's just what you do; it's a family tradition." Its is obvious that these cannot be considered religious, but merely cultural, social reasons. Most pastors on location can confirm the findings: the Church works best when it promises a fabulous celebration. A wedding in white, often in a strange but imposing church, is still very much in vogue, as are pictures of children in white for their First Communion or young adults in dark suits for Confirmation. One in three of those receiving Confirmation, however, doesn't even believe in God. The comparison with the GDR rears its head again: even after socialism had gone bankrupt, Youth Consecration [a secular coming of age ceremony practiced by all 14-year-olds in the GDR] remained in high demand. It even survived the demise of the GDR and, while emptied of its overtly socialist content, is still celebrated. Many worship services, too, are today such exclusively cultural events (e.g. : weekly meeting place, annual folklore, family reunion) that even after a conclusive proof for the non-existence of God they could continue to be celebrated. The autumn of Christendom in Germany has begun. The Church Tax will either be eliminated as a result of political pressure or ultimately run dry by 2030; the last socialized and actively Christian generation will soon be exiting the workforce, and dead within three decades. Then the facade of the Church, too, will crumble. Behind it, a minority will become visible - a minority not much larger than the community of Jehova's Witnesses. At the same time, a veritable renaissance of religion is proclaimed by the media every few years - preferably at Christmas time. Journalists and sociologists convince themselves that they have discovered a trend: a harking back to Christian roots, a new generation's search for meaning, a 'Benedict' - and, most recently, a 'Francis'- Effect. Truth be told, there is no data to support such a trend. The numbers are moving steadily in one direction: down. In 2013 alone, Mass attendance in the Catholic Church dropped by 10 percent. There is no harking back to religion. Interestingly, however, the number of atheists has hardly budged. One might, after all, be tempted to think that the drop-off in Church attendance would correlate with a significant uptick in atheism. There is no such correlation. Even those who are at ends with traditional religions are not satisfied with the explanation that there was once nothing which exploded in a Big Bang, bringing the universe into existence; that mankind - and each and every person - was brought about through evolutionary chance; that the world consists of nothing other than what we can see, measure and understand; that everything ends with death. The question of whence and whither, the question of God is part and parcel of man. In decisive moments - such as those touched by illness and death, by the inscrutable in one's own life, by guilt and failure, hope and mourning, and, not least of all, by the experience of love - the question of God poses itself to the human consciousness. Karl Rahner once said: "Even if, one day, every religion were to disappear and even the word 'God' were to be completely eradicated, then someone would simply invent the word anew to describe the nameless mystery of our existence." For the vast majority of people, whether in or outside the Church, the question of God remains a life-long issue with which they never really come to terms. The vicissitudes of life are also reflected in the biography of faith. Resolute atheism is the exception; a vague, often diffuse faith is the norm today. One could also say: they still exist in large numbers - the seekers and doubters who are asking about God and who are looking for answers - but the churches are reaching them less and less. But why are the seekers no longer finding guidance? Why are the supply and demand no longer jibing? The most popular answer to this question is: because the Church is no longer relevant to the times. She must conform more closely to the realities of the lives of modern people. Initially, that sounds plausible, but under closer scrutiny reveals itself to be idiocy. For the Evangelical church in Germany has done nearly everything which is being demanded from the Catholic Church in order to become more relevant to the times: women priests, the elimination of celibacy, liberality in moral theology, the complete acceptance of homosexuals and the divorced. If these were the real reasons for the malaise of Christendom, the Protestants should be far better off than the Catholics. But that simply isn't the case. A second error in thinking is introduced by the popular buzzword "relevant to the times" [German: zeitgemäß, which can mean "modern," "suitable," or even "appropriate," and often carries all of these shades when applied to the Church]: Wherever the Church does not base herself upon timeless, incontrovertible truth, she reveals herself to be purely man-made. Political programs should be "relevant to the times," entertainment programming, too; but a religion must take command of absolute truths - or it is no religion at all. On the contrary, both churches in Germany - not always officially, but de facto, in practical life - have already long ago abandoned central doctrines of the faith. In the attempt to avoid offending people and make access to the faith as easy as possible, a good deal has been laundered as if with fabric softener: Jesus, Son of God, has been reduced to Jesus, an exemplary man, like Buddha and Gandhi. The Resurrection of Christ has been reduced to a legend which is not to be taken literally, but rather in the sense of "who has love in his heart never dies." The lowest common denominator of the preaching often consists of nothing more than feel-good prose which should be acceptable to as many people as possible and for precisely that reason comes off as arbitrary. Peace on earth, more justice for all, being less egotistical - every group of halfway decent people can agree on that. Besides, an appeal from UNESCO or Greenpeace doesn't sound much different. Why should God be any different? When the churches are all full - at Christmas, that is - everything is quite festive, but the spark of faith rarely catches fire. Many visitors wonder - both at the church and themselves. What were they actually looking for? And why didn't they find it? Of sacred acts there is very little to notice. And if the spiritual nomad finds himself at a more tradition-oriented liturgy, the result is no better, for the stranger is all the more strange here, and turns away all the more baffled. Liturgy assumes a good deal of knowledge; otherwise, one sees nothing more than ballyhoo and mumbo-jumbo. Perhaps the person of today, with all his enlightened cleverness, occasionally stands in his own way. Faith requires a pinch of naivete, the readiness to give up control and open oneself to the Incomprehensible. Groping and hoping. No wonder that many find this increasingly difficult in a world which is set upon industrially reorganizing the last untouched domains of being: sexuality, love, birth, death. Total control, complete autocracy over one's own life is in trend. A more inhospitable breeding ground for faith is barely conceivable. And yet, the churches themselves have done their fair share to destroy piety and the naivete of faith - or better: the immediacy of religious imagery. The storm against traditional forms was born in many minds. Perhaps this is the most calamitous development of modern theology: the desire to loose the content from its images, to abstract the faith and thereby to trust that modern man can accomplish more with a concept than with an image. A delusion. A faith without images is an ideology, and an ideology is judged in the mind of the individual and by the spirit of the times. An image remains an image: it challenges, fascinates, irritates, is accepted or rejected - but it proclaims itself. He who destroys images leaves nothing of the content. He who no longer wants to conceive of God as a Person, but rather as an abstract Being, as an Energy or Force, such a one will also thereby lose his faith. Every human relationship - and faith is precisely that - requires as its counterpart a living person. Menachem Ben-Sasson of the famed Sassoon family was at the Vatican yesterday under the auspices of representing the Hebrew University of Jerusalem. Meachem, is the current president of Hebrew University, and a former member of Israel's Knesset where he represented the Kadima Party, an offshoot of the Likud Party. While in the Knesset, he served as the chairman of the Constitution, Law, and Justice Committee, chairman of the Parliamentary Inquiry Committee on Wiretapping, and also chaired the Lobby for Higher Education. As a university professor he received his PhD in the History of the Jewish People in the Islamic Lands. His three major works are Jews in the Era of Transition - the Traditional World; the Jews of Sicily; The Rise of the Local Jewish Community in Muslim Lands. In addition, he specializes in research on the topic of Mosheh ben Maimon (aka Maimonides, RaMBaM) and the impact he has had on Jewry in Eastern Europe. Many of these studies were sponsored with grants from the Rothschild family. Menachem has also served as a board member of Yad Vashem. Just to keep to the theme of family, Felix Warburg (yes, a Sassoon relative), founder of America's Federal Reserve System, also founded the Hebrew University in Jerusalem. So here, we have a member of the Sassoon family meeting with Francis to discuss anti-semitism. What a crazy world we live in! Using science to fight anti-semitism which has its origins in despicable behavior! The Sassoon family for those who don't know earned their fortune through opium dealing, slave trading and cotton. If you don't think that's great, you must be an anti-semite! They put their ill-gotten gains into legitimate businesses which they soon dominated as well. One of the ways the Sassoons accomplished this was by putting their illegitimate and legitimite competitors out of business through usury, by lending them money through shell companies. When times temporarily got lean for the Sassoons their relatives the Rothschilds were always there to bail them out and call in loans of their competitors. The Sassoons are philanthropists as long as it continues to benefit their tribe, having built hospitals, synagogues, schools, museums, libraries, convalescent homes, Masonic Lodges, and even helped create the nation of Israel. Speaking of hospitals and drugs, the Sassoons had opium pushed in hospitals as a cure for leprosy! Today, Hebrew University is a leading educational institution researching the use of illegal narcotics for use in health care. The Sassoons are also proponents of the kaballah and responsible for its wide spread throughout Europe and the rest of the world. David Sassoon had at one time the largest private library of Judaica known. Famous historian Gerhard Scholem (aka Gershom Scholem) used this library as the basis for his writings on kabbalah, magic, and mysticism. We can hear the cries, "but Menachem Ben-Sasson can't help what his relatives and ancestors did!" As we have tried to demonstrate above the Sassoons believe in keeping it in the family. What better way than having your own in-house historian of your own blood gloss over all the evils perpetrated by your family? And what line is he selling today? Of course, maybe Menachem Ben-Sasson was just meeting Francis because he had heard the Sistine Chapel was available for rent and he wanted to throw a celebration party there. 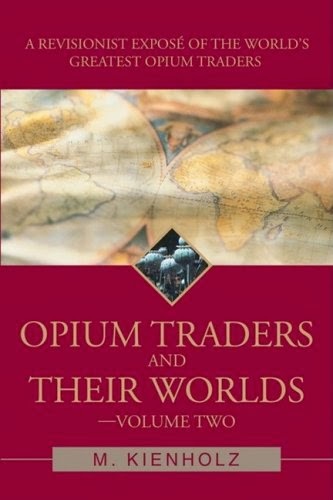 Wonder who would supply the opium? What did Francis tweet the day after he met the delegation from Hebrew University? Like a good student he regurgitated the company line. Francis is doing his part in helping Our Lord's Crucifixion become a footnote in the history books. For an introduction on the Sassoon family we suggest the two excellent revisionist volumes below by Mary Kienholz. After being contacted by several people who wish to remain anonymous we at Call Me Jorge... decided to add this note. We became aware of Menachem Ben-Sasson during Francis' May 2014 visit to Israel. At that time we researched his family tree all the way to 1850 which is as far back as we could find. In the 1900's the Derechinsky family changed their last name to Ben-Sasson. Due to our studies of genealogy and finding families changing their last names often to a more prominent relative's surname from the past in order to help themselves in the present and our extensive study of the Sassoon family, all the pieces seemed to fit. 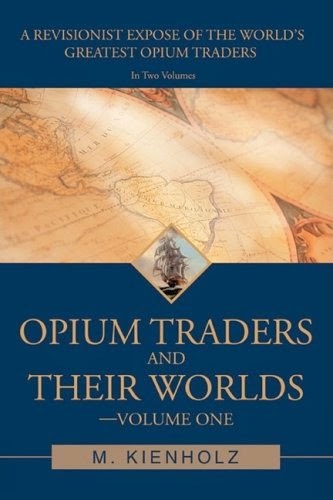 If Ben-Sasson is not of the Sassoon family then his father changed the family's surname into one of a slave trading, opium dealing, ruthless family by coincidence. We at Call Me Jorge... feel this doesn't lesson the anti-Catholic message of Holocaustianity which Menachem Ben-Sasson and Francis were selling at the Vatican the other day. God created her a female but that wasn't good enough for Neria Lejárraga. This past weekend, Francis received a 'transgendered' person, who styles herself Neria Diego Lejárraga. See dear reader, Neria Lejárraga was a female for the first 40 years of her life. She didn't like the way God created her so she did something about it. "My prison was my own body because it did not correspond at all with what my soul felt." After many plastic surgeries, hormone treatments, and physical surgeries she became a he, at least in her mind and began to call herself Diego. Fast forward to the present day when Neria who according to her words was a member of a devout Catholic family was told by her parish priest, "How dare you come here with your condition? You're not worthy," at communion. 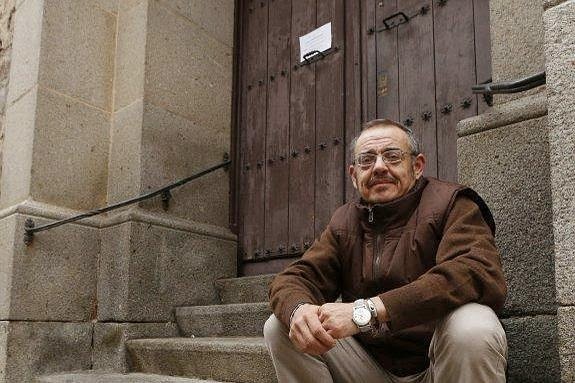 This priest later told her, "You are the devil's daughter," when he saw her in the streets. Neria decided to do something about it and wrote a letter to Francis. What do you think happened next? That's correct, Francis read the letter and called Neria to talk. A second phone call set the date and time for Neria and her female fiance to come for a visit at the Vatican. The time was 5:00PM, the place Casa Santa Marta, and the date 24 January 2015. Not much is known of what transpired in the private meeting. According to Neria, Francis gave her a 'spiritual' hug, they talked, and Neria says she now feels a man at peace. The Vatican has not yet commented on the latest antics of Francis. 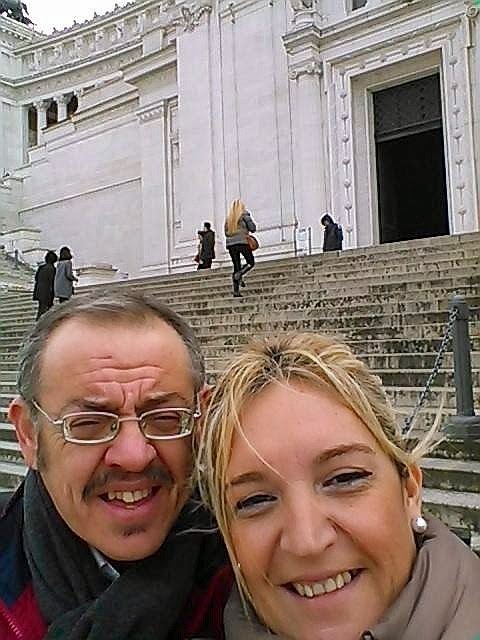 Neria (Diego) with glasses and her fiance in Rome. 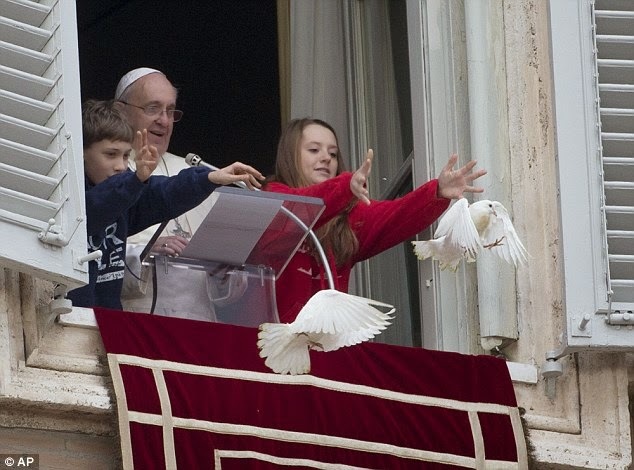 At the Sunday Angelus, Francis had balloons released as a sign of peace. The balloons replaced two doves which were used in 2014. 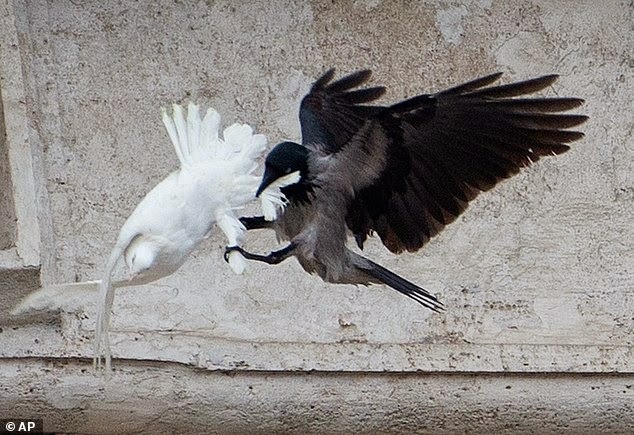 Those two doves made world news as one was attacked by a crow and the other by a seagull. At this point, we at Call Me Jorge... could care less what the loquacious Francis had to say. We will warn readers that at last year's event he prayed for peace in the Ukraine. Soon after, things went downhill in that country. So expect similar things resulting from this year's plea. The dove is a symbol of the Holy Ghost and in modern times a symbol of peace. The crow, a trickster as well as the bird sent out by Noah to search for land never to return to the ark, attacks one of the doves. 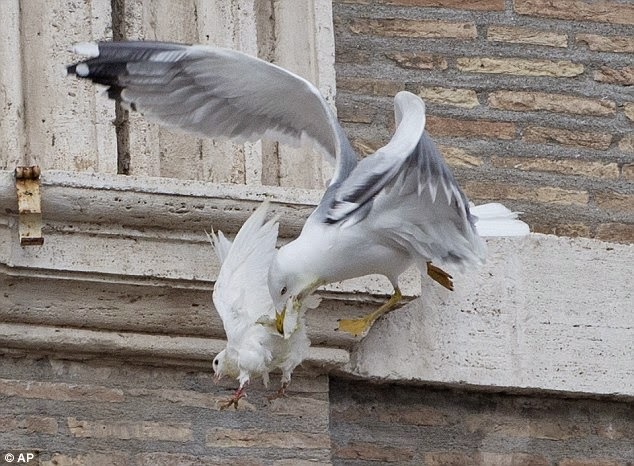 A seagull, attacks the other dove. The seagull is like Francis in that , he flies into a picnic uninvited, eats all the food, goes to the bathroom, and leaves the mess for someone else to clean up after he flies away. Francis, like a balloon, is full of hot air! Berkun believes that there is a chance Pollard can be freed, but it will take pressure on the White House, he said. Pollard gave secrets to Israel, but none of those secrets caused any harm or death to an American. According to Berkun, individuals that gave secrets to other countries that caused harm to Americans have had lesser prison sentences than Pollard. Fellow members of his Talmudic Jewish religion think very highly of Berkun as can be seen in comments made by the late Senator Arlen Specter addressing the Senate (click here to watch video). Alvin Berkun greets Donald Wuerl during a reception at Oakland Catholic High School following Wuerl's farewell Mass of Thanksgiving at St. Paul Cathedral in Oakland. A Pittsburgh rabbi attended Pope Francis' first meeting with an official Jewish delegation, where the pope strongly affirmed the Vatican II condemnation of anti-Semitism. "Due to our common roots, a Christian cannot be anti-Semitic!" Pope Francis declared, referencing a Vatican II document, Nostra Aetate, that emphasized the Jewish roots of Christianity. Using a favorite phrase of Pope John Paul II, he greeted his guests with "Dear elder brothers and sisters, Shalom." 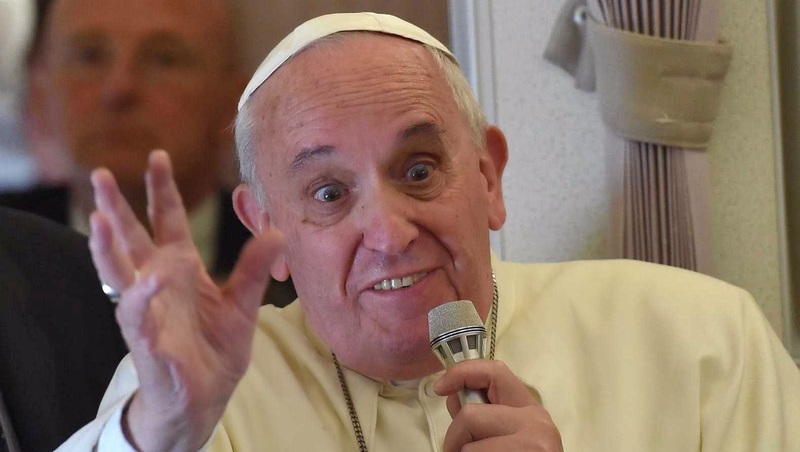 In his relationship with Jews, "this pope is as close as any pope could be," said Rabbi Alvin Berkun, rabbi emeritus of Tree of Life Congregation in Squirrel Hill and a past president of the Rabbinical Assembly, the international organization for rabbis in the conservative movement. "He is really very good for Jews, no question about it." Rabbi Berkun was among 30 representatives of the Jewish Committee on Interreligious Consultations to meet with Pope Francis on Monday. The group has been the Vatican's partner in dialogue since 1970. Rabbi Berkun has been involved for about half that time. He studied under Rabbi Abraham Joshua Heschel, who helped the bishops at Vatican II draft Nostra Aetate. It denounced anti-Jewish bigotry, especially a popular notion that all Jews were "Christ-killers." 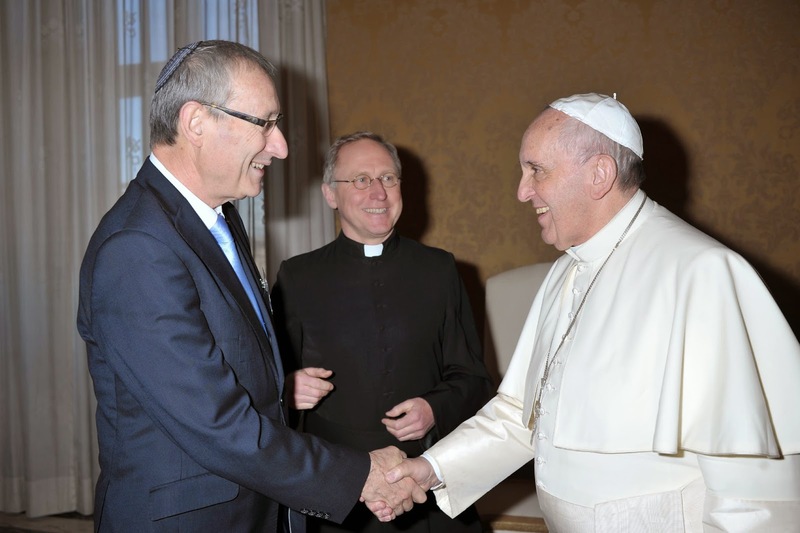 When there are serious tensions in Catholic-Jewish relations, Vatican officials have been known to call Rabbi Berkun directly to explain their point of view. He credits Pope Benedict XVI with good intentions despite occasional gaffes, and has long honored Pope John Paul II for modeling friendship and respect for Jews and Judaism. But while Pope John Paul exercised his pre-papal ministry in a post-Holocaust Poland largely devoid of Jews, Cardinal Jorge Bergoglio worked alongside a thriving Jewish community before he was elected pope. "This pope's life intersected with all of those rabbis in Buenos Aires. He could have absented himself from those relationships, but they were very important to him," Rabbi Berkun said. He had met Cardinal Bergoglio during a 2004 meeting of the dialogue group in Buenos Aires. He visited a Catholic-Jewish project to help the city's poorest people with food and job training. There he took a photo of a priest and a rabbi walking together through a slum. He showed it to Pope Francis when they had a brief chat. 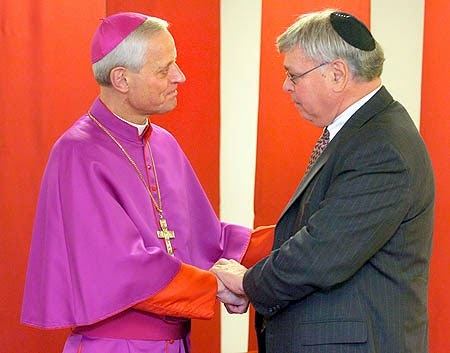 "I also told him that Pittsburgh is the only diocese in the world that has the program where rabbis teach in the parochial schools. We've been doing it for 11 years now, and Catholic educators also come to our synagogues to talk about changes in Catholic-Jewish relations," he said. He was describing the Catholic-Jewish Educational Enhancement Program, in which rabbis teach the religion classes once a month at all Catholic high schools in the Diocese of Pittsburgh. The pope, he said, "appreciated hearing about C-JEEP in Pittsburgh." Although Rabbi Berkun is thrilled with the progress in Catholic-Jewish relations since 1965, he worries that it's known mostly to theologians, not ordinary Catholics and Jews. Pope Francis, be believes, can take the message to grass roots. "The church has clearly adopted [Nostra Aetate's] principles -- thus my audience today and the tremendous progress in interfaith relations in Pittsburgh," he said. "I would like to see, on the eve of the 50th anniversary of Nostra Aetate, the pope's promulgation and implementation to the believer in the pew. He surely believes anti-Semitism is a sin. His flock, especially in Europe, has to hear him say it again and again." Secondly, yesterday at Madhu I saw something which I would never have expected: not everyone there was Catholic, not even the majority! There were Buddhists, Muslims, Hindus, and each one came to pray; they go and they say they receive graces there. There is in the people – and the people are never wrong – they sense that there is something there that unites them. And if they are so naturally united in going together to pray at that shrine – which is Christian but not only Christian, because all want [to go there], then why shouldn’t I go to a Buddhist temple to greet them? What happened yesterday at Madhu is very important. It helps us to understand the meaning of the interreligious experience in Sri Lanka: there is respect for one another. There are small fundamentalist groups, but these are not with the people: they are ideological elites, but they are not with the people. 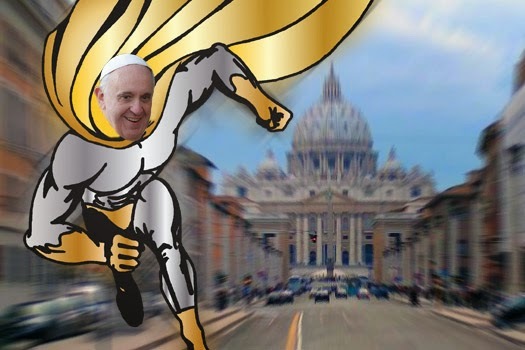 Francis is now the Superpope! 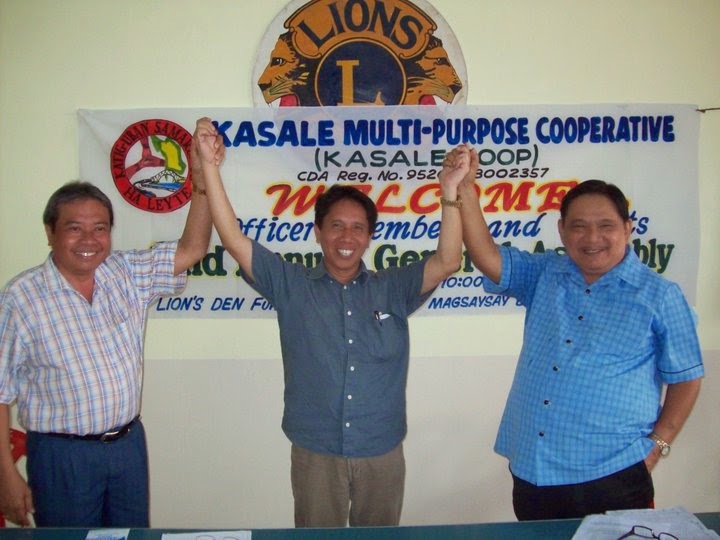 "braving typhoon Amang in order to be with survivors of super typhoon Yolanda and to celebrate Mass with them."